Infographics (a portmanteau of information and graphics) are a visually attractive way of displaying (often complex) data. An infographic can display a whole variety of data, from charts and graphs to timelines and flow diagrams. Government as a Platform (click to enlarge). You can find plenty more examples and inspiration on websites showcasing infographics such as Visual.ly, Guardian Data (particularly good for political stats) and the Cool Infographics blog. Given the popularity of visually-driven social networks such as Pinterest and Tumblr, infographics are a great way of gaining exposure. For instance, our Government as a Platform infographic received over 10,000 views on the graphic design showcase Creattica and has also appeared on the infographic gallery Powerful Infographic. What if I Don’t Have Good Design Skills? No problem! There are plenty of websites requiring little to no technical knowledge that can generate infographics out of your data. Sites such as infogr.am, visual.ly and ease.ly provide a foolproof online interface for personalising a variety of pre-made layouts with your data. For interactive timelines, try Timeline JS or Wordle if you’re interested in creating ‘word clouds’. 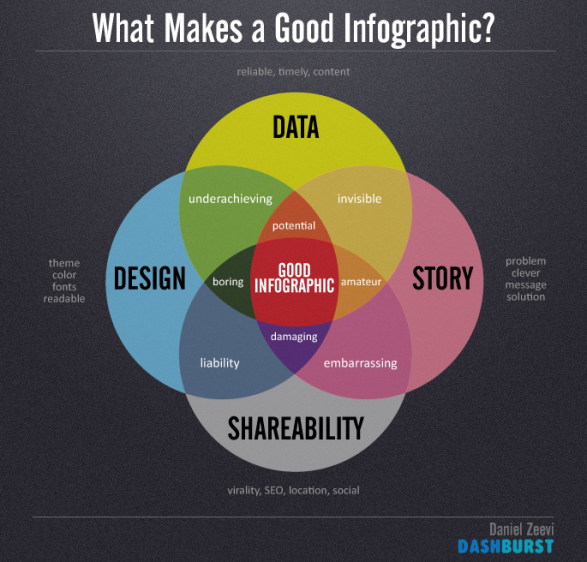 Is There Anything to Keep in Mind When Creating Infographics? Have a think about what data would be interesting to your audience. For example, local councils would probably have plenty of interesting stats at their fingertips, from local budget numbers to crime figures to opinion polls. You could even share data from a recent consultation in an infographic. However, interesting data may also be seen as “stuff you shouldn’t be sharing”, so remember to think carefully about the potential consequences of releasing that data to the public. I’ve said it before and I’ll say it again. Your infographic can be the most wonderfully-designed thing in the world, but disobey the laws of statistics and it becomes nothing more than a pretty picture. Irrelevant and misinterpreted data can be confusing for your audience and potentially embarrassing for you. If you’re looking for a non-mathematical, common sense guide to mainstream statistics, I’d recommend having a read through of The Tiger That Isn’t. In a similar way that having a great design and bad data is unhelpful, it’s equally problematic if you have great data and a bad design. Infographics need to be aesthetically pleasing to increase the likehood of being shared, but the design should make sure the data can be understood easily. For eye-catching ideas and colour palette inspiration, try Colour Lovers or Adobe’s Kuler. Also, remember to think about what fonts are appropriate to use. It’s nice to have a font that’s quirky and stands out but the novelty will be lost if viewers struggle to read it on a computer screen. Finally, remember that no font is more controversial than Comic Sans. You have been warned!